Love is in the air… and on the big screen! And no, we have not wound back the calendar to February! But, with two new local films releasing on the circuit that feature love firmly at the centre of their storylines, it’s time to celebrate all the emotions that this four-letter word brings! The release of both All About Love (from Friday, 21 April), and Love By Chance on Friday, 05 May, gives us as proud South Africans even more reason to feel good, as they are both romantic drama/comedies with a strong local flavour. “As South Africa’s leading cinema exhibitor, Ster-Kinekor is once again showing its commitment to the local film industry and lending its support to the release of local films. We are especially excited to be the exclusive exhibitor to screen All About Love, and look forward to movie lovers filling up the cinemas once it releases,” says Motheo Matsau, Chief of Marketing and Sales of Ster-Kinekor Theatres. All About Love features a strong, all-African cast that gives the film an intriguing continental feel. Shot in and around the vibrant city of Johannesburg, this new romantic comedy explores the interesting, bitter-sweet and sometimes difficult, but always instructive, journeys of the heart. 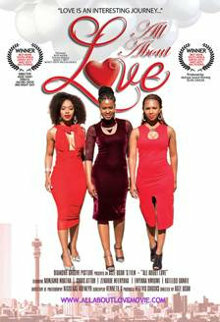 The leading ladies are played by popular South African actress and flavour of the moment, Nomzamo Mbatha, alongside Katlego Danke and Zenande Mfenyana. Joining this local star-studded line-up are Richard Lukunku and Angela Sithole (also from South Africa), Chris Attoh (Ghana), Leroy Gopal (Zimbabwe) and Enyinna Nwigwe (Nigeria), among others. Written and directed by Adze Ugah (Jacob’s Cross, Isibaya, Mrs Right Guy), the film also showcases the talents of Emmy Award-winning director of photography Nicholas Hofmeyr. Following a night of red-carpet glamour at the film’s premiere at The Zone in Rosebank, Johannesburg, tonight (20 April), the film releases exclusively at select Ster-Kinekor cinemas around the country on Friday, 21 April. These include The Zone @Rosebank, Eastgate, Southgate, Newtown Junction and Festival Mall in Johannesburg, Maponya Mall in Soweto, Mall of Africa in Midrand, Sterland and Wonderpark in Pretoria, Mall of the North in Polokwane, Musgrave in Durban and Parow in Cape Town. While All About Love features an exciting cross-continental collaboration, Love By Chance crosses the Atlantic Ocean to create a wonderful combination of South African and American talent. The film, directed and produced by Samad Davis, was shot in Atlanta, Georgia, USA. Love By Chance is a romantic dramedy about two aspiring South African actors, played by Altovise Lawrence and Atandwa Kani, who independently are in America trying to make it big in the extremely difficult and over-saturated Hollywood industry… sound familiar? The characters meet by chance, but between the everyday struggle of auditioning, dealing with daily rejection, self-doubt, financial hardship, crazy friends and a mad dating scene, who actually has time for love? As the film releases at Ster-Kinekor cinemas countrywide on Friday, 05 May, local audiences and fans alike will have the chance to find themselves ‘up close and personal’ with the popular stars. Altovise Lawrence and Atandwa Kani, together with other cast members, will be meeting and greeting fans at various cinemas and events, to sign autographs and take photographs. By posting these on social media including the Ster-Kinekor Facebook page, you could win a great hamper from leading make-up brand, MUD. The stars will make an appearance at a special pre-screening of Love By Chance at The Zone in Rosebank on Wednesday, 03 May, so come on down and show your support for local cinema! If you are in Cape Town, head to N1 City on Friday, 05 May from 7.00pm to meet Altovise and Atandwa before the film’s screening at 8pm. The two lead actors will then be whisked back to Gauteng to meet fans at Sterland in Pretoria on Saturday, 06 May from 2pm. Altovise Lawrence, the winner of the first season of Top Actor South Africa, stars as the main character, Bailey, alongside Atandwa Kani, son of South African actor, director, and playwright John Kani, together with a host of local and international stars, including Nicholas Nkuna (Top Actor South Africa) and Denise Zimba (Generations: The Legacy). US co-stars include funny man Carl Anthony Payne II (Martin), Clifton Powell (Ray, Rush Hour, Grand Theft Auto), Terri J. Vaughn (Girldriends Getaway, Greenleaf and The Steve Harvey Show), E. Roger Mitchell (Flight, Equalizer) and Lil Zane (former rap superstar and actor). The film’s local producers are Dumi Gumbi and Cati Weinek of the Ergo Company, who produced the recent films, Mrs Right Guy, and winner of Best Film at the 2016 Jozi Film Festival, Dora’s Peace. Production on the film started in October 2016 in Atlanta, Georgia, with all post production taking place in South Africa, making it a truly collaborative production between the producers and countries. The film, distributed locally by Indigenous Film Distribution, releases on Friday, 05 May at select Ster-Kinekor cinemas countrywide. For more information on All About Love and Love By Chance, and for screening details, visit www.sterkinekor.com or download the SK App on your smartphone. You can also book at the box office. For news and updates, go to Facebook: Ster-Kinekor Theatres | follow Ster-Kinekor on Twitter: @sterkinekor. For all queries, call Ticketline on 0861-Movies (668 437).